Managing IT systems is difficult. Virtualization brings numerous benefits to the datacenter and system administrators. However, it also creates a new set of choices. More choice implies more decisions, and thus an increased management responsibility. Furthermore, the move toward cloud computing, with a service-based acquisition and delivery model, requires that datacenter managers take a holistic view of the resources that they manage and the actors that access the data center. IBM® Service Delivery Manager addresses this problem domain. Delivered as a set of appliances, it automates provisioning, deprovisioning, metering, and management of an IT platform, and the services it provides. It addresses the needs of both IT management and service users. 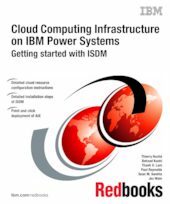 This IBM Redbooks® publication is intended for technical professionals who want to understand and deploy IBM ISDM Cloud on a Power platform.